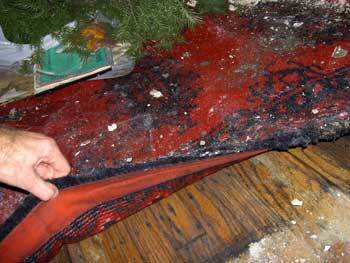 Redwood Environmental Services - How to Prevent Mold? Molds can be found almost anywhere; it can grow on virtually any substance containing moisture and where some type of food source is present. Decrease mold growth by venting bathrooms, dryers, and other moisture-generating sources to the outside; using air conditioners and de-humidifiers; increasing ventilation; and using exhaust fans whenever cooking, dishwashing and cleaning. Clean and dry any damp or wet building materials and furnishings within 24-48 hours to prevent mold growth. If you've experienced a plumbing "event", call a professional drying company - the sooner you get it dry the less chance you will have of mold growth. Reduce the potential for condensation on cold surfaces (i.e., windows, piping, exterior walls, roof or floors) by adding insulation. In areas where there is a perpetual moisture problem, do not install carpeting (i.e., near drinking fountains, classroom sinks or on concrete floors with leaks or frequent condensation). Replace carpet with hard flooring if possible. WhAT SHOULD I DO IF I FIND MOLD? Clean mold off hard surfaces with water and detergent, and dry completely. Washables should be washed three times in the hottest water. Mattresses, stuffed animals, overstuffed fabric furniture that shows visible mold which has been confirmed by professional environmental lab testing, should probably be discarded. These items can be professionally remediated, however the costs usually exceed the value. If mold becomes a problem in your home or business, industry standards - IICRC S520 (www.iicrc.org) - advise removal of the mold after the water source/sources are stopped. Always get THREE QUOTES if you do require remediation. Always test after the remediation and before you close up the project. Always read any contract that you sign - ask who pays for clearance testing if your project fails. Responsible remediators should guarantee clearance or they will pay for further testing. > How does it grow in my house? > What can it do to me and my family? Potential health effects and symptoms associated with mold exposure include allergic reactions and other respiratory complaints. Further hazards of mold here. Find out more about mold & allergen inpsections here.